The hydrophobic and hydrophilic regions of plasma membranes aid the diffusion of some molecules and hinder the diffusion of others. Describe how membrane permeability, concentration gradient, and molecular properties affect biological diffusion rates. The interior and exterior surfaces of the plasma membrane are not identical, which adds to the selective permeability of the membrane. Fat soluble substances are able to pass easily to the hydrophobic interior of the plasma membrane and diffuse into the cell. Polar molecules and charged molecules do not diffuse easily through the lipid core of the plasma membrane and must be transported across by proteins, sugars, or amino acids. amphiphilic: Having one surface consisting of hydrophilic amino acids and the opposite surface consisting of hydrophobic (or lipophilic) ones. Plasma membranes are asymmetric: the interior of the membrane is not identical to the exterior of the membrane. In fact, there is a considerable difference between the array of phospholipids and proteins between the two leaflets that form a membrane. On the interior of the membrane, some proteins serve to anchor the membrane to fibers of the cytoskeleton. There are peripheral proteins on the exterior of the membrane that bind elements of the extracellular matrix. Carbohydrates, attached to lipids or proteins, are also found on the exterior surface of the plasma membrane. These carbohydrate complexes help the cell bind substances that the cell needs in the extracellular fluid. This adds considerably to the selective nature of plasma membranes. Asymmetry in Plasma Membranes: The exterior surface of the plasma membrane is not identical to the interior surface of the same membrane. Recall that plasma membranes are amphiphilic; that is, they have hydrophilic and hydrophobic regions. This characteristic helps the movement of some materials through the membrane and hinders the movement of others. Lipid-soluble material with a low molecular weight can easily slip through the hydrophobic lipid core of the membrane. Substances such as the fat-soluble vitamins A, D, E, and K readily pass through the plasma membranes in the digestive tract and other tissues. Fat-soluble drugs and hormones also gain easy entry into cells and are readily transported into the body’s tissues and organs. Molecules of oxygen and carbon dioxide have no charge and so pass through membranes by simple diffusion. Polar substances present problems for the membrane. While some polar molecules connect easily with the outside of a cell, they cannot readily pass through the lipid core of the plasma membrane. Additionally, while small ions could easily slip through the spaces in the mosaic of the membrane, their charge prevents them from doing so. Ions such as sodium, potassium, calcium, and chloride must have special means of penetrating plasma membranes. Simple sugars and amino acids also need help with transport across plasma membranes, achieved by various transmembrane proteins (channels). Diffusion across a semipermeable membrane: This interactive shows that smaller molecules have an easier time making it across a semipermeable membrane. Adjust the pore size so the larger molecules can make it through! Diffusion is a process of passive transport in which molecules move from an area of higher concentration to one of lower concentration. Describe diffusion and the factors that affect how materials move across the cell membrane. Substances diffuse according to their concentration gradient; within a system, different substances in the medium will each diffuse at different rates according to their individual gradients. After a substance has diffused completely through a space, removing its concentration gradient, molecules will still move around in the space, but there will be no net movement of the number of molecules from one area to another, a state known as dynamic equilibrium. Several factors affect the rate of diffusion of a solute including the mass of the solute, the temperature of the environment, the solvent density, and the distance traveled. Diffusion is a passive process of transport. A single substance tends to move from an area of high concentration to an area of low concentration until the concentration is equal across a space. You are familiar with diffusion of substances through the air. For example, think about someone opening a bottle of ammonia in a room filled with people. The ammonia gas is at its highest concentration in the bottle; its lowest concentration is at the edges of the room. The ammonia vapor will diffuse, or spread away, from the bottle; gradually, more and more people will smell the ammonia as it spreads. Materials move within the cell ‘s cytosol by diffusion, and certain materials move through the plasma membrane by diffusion. Diffusion expends no energy. On the contrary, concentration gradients are a form of potential energy, dissipated as the gradient is eliminated. Diffusion: Diffusion through a permeable membrane moves a substance from an area of high concentration (extracellular fluid, in this case) down its concentration gradient (into the cytoplasm). Each separate substance in a medium, such as the extracellular fluid, has its own concentration gradient independent of the concentration gradients of other materials. In addition, each substance will diffuse according to that gradient. Within a system, there will be different rates of diffusion of the different substances in the medium. Extent of the concentration gradient: The greater the difference in concentration, the more rapid the diffusion. The closer the distribution of the material gets to equilibrium, the slower the rate of diffusion becomes. Mass of the molecules diffusing: Heavier molecules move more slowly; therefore, they diffuse more slowly. The reverse is true for lighter molecules. Temperature: Higher temperatures increase the energy and therefore the movement of the molecules, increasing the rate of diffusion. Lower temperatures decrease the energy of the molecules, thus decreasing the rate of diffusion. Solvent density: As the density of a solvent increases, the rate of diffusion decreases. The molecules slow down because they have a more difficult time getting through the denser medium. If the medium is less dense, diffusion increases. Because cells primarily use diffusion to move materials within the cytoplasm, any increase in the cytoplasm’s density will inhibit the movement of the materials. An example of this is a person experiencing dehydration. As the body’s cells lose water, the rate of diffusion decreases in the cytoplasm, and the cells’ functions deteriorate. Neurons tend to be very sensitive to this effect. Dehydration frequently leads to unconsciousness and possibly coma because of the decrease in diffusion rate within the cells. Solubility: As discussed earlier, nonpolar or lipid-soluble materials pass through plasma membranes more easily than polar materials, allowing a faster rate of diffusion. Surface area and thickness of the plasma membrane: Increased surface area increases the rate of diffusion, whereas a thicker membrane reduces it. Distance travelled: The greater the distance that a substance must travel, the slower the rate of diffusion. This places an upper limitation on cell size. A large, spherical cell will die because nutrients or waste cannot reach or leave the center of the cell. Therefore, cells must either be small in size, as in the case of many prokaryotes, or be flattened, as with many single-celled eukaryotes. A variation of diffusion is the process of filtration. In filtration, material moves according to its concentration gradient through a membrane; sometimes the rate of diffusion is enhanced by pressure, causing the substances to filter more rapidly. This occurs in the kidney where blood pressure forces large amounts of water and accompanying dissolved substances, or solutes, out of the blood and into the renal tubules. The rate of diffusion in this instance is almost totally dependent on pressure. One of the effects of high blood pressure is the appearance of protein in the urine, which is “squeezed through” by the abnormally high pressure. Facilitated diffusion is a process by which molecules are transported across the plasma membrane with the help of membrane proteins. A concentration gradient exists that would allow ions and polar molecules to diffuse into the cell, but these materials are repelled by the hydrophobic parts of the cell membrane. Facilitated diffusion uses integral membrane proteins to move polar or charged substances across the hydrophobic regions of the membrane. 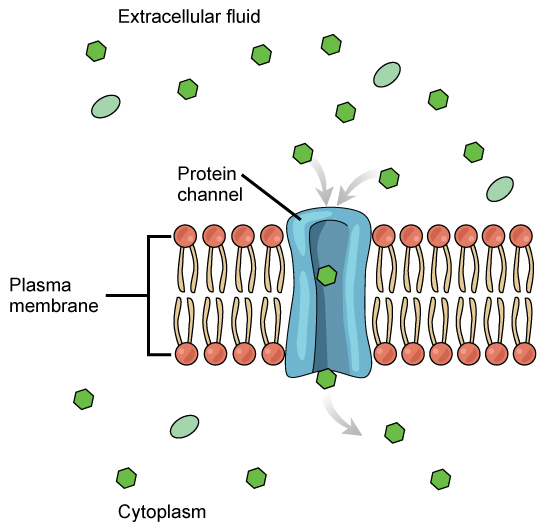 Channel proteins can aid in the facilitated diffusion of substances by forming a hydrophilic passage through the plasma membrane through which polar and charged substances can pass. Channel proteins can be open at all times, constantly allowing a particular substance into or out of the cell, depending on the concentration gradient; or they can be gated and can only be opened by a particular biological signal. Carrier proteins aid in facilitated diffusion by binding a particular substance, then altering their shape to bring that substance into or out of the cell. facilitated diffusion: The spontaneous passage of molecules or ions across a biological membrane passing through specific transmembrane integral proteins. membrane protein: Proteins that are attached to, or associated with the membrane of a cell or an organelle. Facilitated transport is a type of passive transport. Unlike simple diffusion where materials pass through a membrane without the help of proteins, in facilitated transport, also called facilitated diffusion, materials diffuse across the plasma membrane with the help of membrane proteins. A concentration gradient exists that would allow these materials to diffuse into the cell without expending cellular energy. However, these materials are ions or polar molecules that are repelled by the hydrophobic parts of the cell membrane. Facilitated transport proteins shield these materials from the repulsive force of the membrane, allowing them to diffuse into the cell. The material being transported is first attached to protein or glycoprotein receptors on the exterior surface of the plasma membrane. This allows the material that is needed by the cell to be removed from the extracellular fluid. The substances are then passed to specific integral proteins that facilitate their passage. Some of these integral proteins are collections of beta-pleated sheets that form a channel through the phospholipid bilayer. Others are carrier proteins which bind with the substance and aid its diffusion through the membrane. The integral proteins involved in facilitated transport are collectively referred to as transport proteins; they function as either channels for the material or carriers. In both cases, they are transmembrane proteins. Channels are specific for the substance that is being transported. Channel proteins have hydrophilic domains exposed to the intracellular and extracellular fluids; they additionally have a hydrophilic channel through their core that provides a hydrated opening through the membrane layers. Passage through the channel allows polar compounds to avoid the nonpolar central layer of the plasma membrane that would otherwise slow or prevent their entry into the cell. Aquaporins are channel proteins that allow water to pass through the membrane at a very high rate. Channel Proteins in Facilitated Transport: Facilitated transport moves substances down their concentration gradients. They may cross the plasma membrane with the aid of channel proteins. Channel proteins are either open at all times or they are “gated,” which controls the opening of the channel. The attachment of a particular ion to the channel protein may control the opening or other mechanisms or substances may be involved. In some tissues, sodium and chloride ions pass freely through open channels, whereas in other tissues, a gate must be opened to allow passage. An example of this occurs in the kidney, where both forms of channels are found in different parts of the renal tubules. Cells involved in the transmission of electrical impulses, such as nerve and muscle cells, have gated channels for sodium, potassium, and calcium in their membranes. Opening and closing of these channels changes the relative concentrations on opposing sides of the membrane of these ions, resulting in the facilitation of electrical transmission along membranes (in the case of nerve cells) or in muscle contraction (in the case of muscle cells). Another type of protein embedded in the plasma membrane is a carrier protein. This protein binds a substance and, in doing so, triggers a change of its own shape, moving the bound molecule from the outside of the cell to its interior; depending on the gradient, the material may move in the opposite direction. Carrier proteins are typically specific for a single substance. This adds to the overall selectivity of the plasma membrane. The exact mechanism for the change of shape is poorly understood. Proteins can change shape when their hydrogen bonds are affected, but this may not fully explain this mechanism. Each carrier protein is specific to one substance, and there are a finite number of these proteins in any membrane. This can cause problems in transporting enough of the material for the cell to function properly. Carrier Proteins: Some substances are able to move down their concentration gradient across the plasma membrane with the aid of carrier proteins. Carrier proteins change shape as they move molecules across the membrane. An example of this process occurs in the kidney. Glucose, water, salts, ions, and amino acids needed by the body are filtered in one part of the kidney. This filtrate, which includes glucose, is then reabsorbed in another part of the kidney. Because there are only a finite number of carrier proteins for glucose, if more glucose is present than the proteins can handle, the excess is not transported; it is excreted from the body in the urine. In a diabetic individual, this is described as “spilling glucose into the urine.” A different group of carrier proteins called glucose transport proteins, or GLUTs, are involved in transporting glucose and other hexose sugars through plasma membranes within the body. Channel and carrier proteins transport material at different rates. Channel proteins transport much more quickly than do carrier proteins. Channel proteins facilitate diffusion at a rate of tens of millions of molecules per second, whereas carrier proteins work at a rate of a thousand to a million molecules per second. Osmosis is the movement of water across a membrane from an area of low solute concentration to an area of high solute concentration. Osmosis occurs according to the concentration gradient of water across the membrane, which is inversely proportional to the concentration of solutes. Osmosis occurs until the concentration gradient of water goes to zero or until the hydrostatic pressure of the water balances the osmotic pressure. Osmosis occurs when there is a concentration gradient of a solute within a solution, but the membrane does not allow diffusion of the solute. Osmosis is the movement of water through a semipermeable membrane according to the concentration gradient of water across the membrane, which is inversely proportional to the concentration of solutes. Semipermeable membranes, also termed selectively permeable membranes or partially permeable membranes, allow certain molecules or ions to pass through by diffusion. While diffusion transports materials across membranes and within cells, osmosis transports only water across a membrane. The semipermeable membrane limits the diffusion of solutes in the water. Not surprisingly, the aquaporin proteins that facilitate water movement play a large role in osmosis, most prominently in red blood cells and the membranes of kidney tubules. Osmosis is a special case of diffusion. Water, like other substances, moves from an area of high concentration to one of low concentration. An obvious question is what makes water move at all? Imagine a beaker with a semipermeable membrane separating the two sides or halves. On both sides of the membrane the water level is the same, but there are different concentrations of a dissolved substance, or solute, that cannot cross the membrane (otherwise the concentrations on each side would be balanced by the solute crossing the membrane). If the volume of the solution on both sides of the membrane is the same but the concentrations of solute are different, then there are different amounts of water, the solvent, on either side of the membrane. If there is more solute in one area, then there is less water; if there is less solute in one area, then there must be more water. To illustrate this, imagine two full glasses of water. One has a single teaspoon of sugar in it, whereas the second one contains one-quarter cup of sugar. If the total volume of the solutions in both cups is the same, which cup contains more water? Because the large amount of sugar in the second cup takes up much more space than the teaspoon of sugar in the first cup, the first cup has more water in it. Osmosis: In osmosis, water always moves from an area of higher water concentration to one of lower concentration. 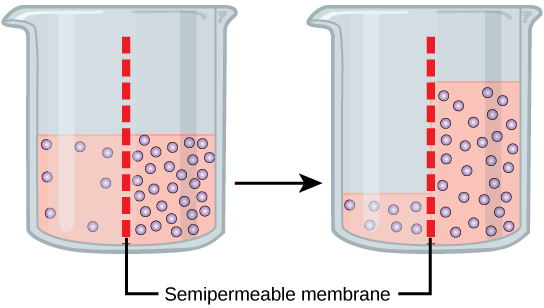 In the diagram shown, the solute cannot pass through the selectively permeable membrane, but the water can. Returning to the beaker example, recall that it has a mixture of solutes on either side of the membrane. A principle of diffusion is that the molecules move around and will spread evenly throughout the medium if they can. However, only the material capable of passing through the membrane will diffuse through it. In this example, the solute cannot diffuse through the membrane, but the water can. Water has a concentration gradient in this system. Thus, water will diffuse down its concentration gradient, crossing the membrane to the side where it is less concentrated. This diffusion of water through the membrane—osmosis—will continue until the concentration gradient of water goes to zero or until the hydrostatic pressure of the water balances the osmotic pressure. In the beaker example, this means that the level of fluid in the side with a higher solute concentration will go up. Tonicity, which is directly related to the osmolarity of a solution, affects osmosis by determining the direction of water flow. Osmolarity describes the total solute concentration of a solution; solutions with a low solute concentration have a low osmolarity, while those with a high osmolarity have a high solute concentration. Water moves from the side of the membrane with lower osmolarity (and more water) to the side with higher osmolarity (and less water). In a hypotonic solution, the extracellular fluid has a lower osmolarity than the fluid inside the cell; water enters the cell. In a hypertonic solution, the extracellular fluid has a higher osmolarity than the fluid inside the cell; water leaves the cell. In an isotonic solution, the extracellular fluid has the same osmolarity as the cell; there will be no net movement of water into or out of the cell. osmolarity: The osmotic concentration of a solution, normally expressed as osmoles of solute per litre of solution. Tonicity describes how an extracellular solution can change the volume of a cell by affecting osmosis. A solution’s tonicity often directly correlates with the osmolarity of the solution. Osmolarity describes the total solute concentration of the solution. A solution with low osmolarity has a greater number of water molecules relative to the number of solute particles; a solution with high osmolarity has fewer water molecules with respect to solute particles. In a situation in which solutions of two different osmolarities are separated by a membrane permeable to water, though not to the solute, water will move from the side of the membrane with lower osmolarity (and more water) to the side with higher osmolarity (and less water). This effect makes sense if you remember that the solute cannot move across the membrane, and thus the only component in the system that can move—the water—moves along its own concentration gradient. An important distinction that concerns living systems is that osmolarity measures the number of particles (which may be molecules) in a solution. Therefore, a solution that is cloudy with cells may have a lower osmolarity than a solution that is clear if the second solution contains more dissolved molecules than there are cells. Three terms—hypotonic, isotonic, and hypertonic—are used to relate the osmolarity of a cell to the osmolarity of the extracellular fluid that contains the cells. In a hypotonic situation, the extracellular fluid has lower osmolarity than the fluid inside the cell, and water enters the cell. (In living systems, the point of reference is always the cytoplasm, so the prefix hypo- means that the extracellular fluid has a lower concentration of solutes, or a lower osmolarity, than the cell cytoplasm. ) It also means that the extracellular fluid has a higher concentration of water in the solution than does the cell. In this situation, water will follow its concentration gradient and enter the cell, causing the cell to expand. 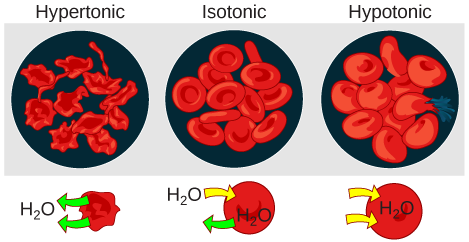 Changes in Cell Shape Due to Dissolved Solutes: Osmotic pressure changes the shape of red blood cells in hypertonic, isotonic, and hypotonic solutions. As for a hypertonic solution, the prefix hyper- refers to the extracellular fluid having a higher osmolarity than the cell’s cytoplasm; therefore, the fluid contains less water than the cell does. Because the cell has a relatively higher concentration of water, water will leave the cell, and the cell will shrink. In an isotonic solution, the extracellular fluid has the same osmolarity as the cell. If the osmolarity of the cell matches that of the extracellular fluid, there will be no net movement of water into or out of the cell, although water will still move in and out. Blood cells and plant cells in hypertonic, isotonic, and hypotonic solutions take on characteristic appearances. Cells in an isotonic solution retain their shape. Cells in a hypotonic solution swell as water enters the cell, and may burst if the concentration gradient is large enough between the inside and outside of the cell. Cells in a hypertonic solution shrink as water exits the cell, becoming shriveled. Osmoregulation is the process by which living things regulate the effects of osmosis in order to protect cellular integrity. In a hypotonic environment, water enters a cell, causing it to swell and burst (lyse). In a hypertonic environment, water leaves a cell, causing it to shrink and die. In plants, in a hypotonic environment, the inflow of water produces turgor pressure, which stiffens the cell walls of the plant, while in a hypertonic environment, turgor pressure is lost, and the plant wilts. Some protists that lack cell walls have contractile vacuoles, which collect excess water from the cell and pump it out, keeping the cell from lysing. Freshwater fish living in a hypotonic environment take in salt through their gills and excrete diluted urine to rid themselves of excess water; saltwater fish living in a hypertonic environment secrete salt through their gills and excrete highly concentrated urine. In vertebrates, osmoreceptors monitor the concentration of solutes in the blood, and albumin controls osmotic pressure in tissues. Tonicity is the ability of a solution to exert an osmotic pressure upon a membrane. There are three types of tonicity: hypotonic, hypertonic, and isotonic. In a hypotonic environment, water enters a cell, and the cell swells. In a hypertonic solution, water leaves a cell and the cell shrinks. In an isotonic condition, the relative concentrations of solute and solvent are equal on both sides of the membrane. There is no net water movement; therefore, there is no change in the size of the cell. If either the hypo- or hyper- condition goes to excess, the cell’s functions become compromised, and the cell may be destroyed. A red blood cell will burst, or lyse, when it swells beyond the plasma membrane ‘s capability to expand. The membrane resembles a mosaic with discrete spaces between the molecules comprising it. If the cell swells and the spaces between the lipids and proteins become too large, the cell will break apart. In contrast, when excessive amounts of water leave a red blood cell, the cell shrinks, or crenates. This has the effect of concentrating the solutes left in the cell, making the cytosol denser and interfering with diffusion within the cell. The cell’s ability to function will be compromised and may also result in the death of the cell. Turgor Pressure and Tonicity in a Plant Cell: The turgor pressure within a plant cell depends on the tonicity of the solution in which it is bathed. Various living things have ways of controlling the effects of osmosis —a mechanism called osmoregulation. Some organisms, such as plants, fungi, bacteria, and some protists, have cell walls that surround the plasma membrane and prevent cell lysis in a hypotonic solution. The plasma membrane can only expand to the limit of the cell wall, so the cell will not lyse. In fact, in plants, the cellular environment is always slightly hypotonic to the cytoplasm, and water will always enter a cell if water is available. This inflow of water produces turgor pressure, which stiffens the cell walls of the plant. In nonwoody plants, turgor pressure supports the plant. Conversely, if the plant is not watered, the extracellular fluid will become hypertonic, causing water to leave the cell. In this condition, the cell does not shrink because the cell wall is not flexible. However, the cell membrane detaches from the wall and constricts the cytoplasm. This is called plasmolysis. Plants lose turgor pressure in this condition and wilt. Turgor Pressure and Plasmolysis: Without adequate water, the plant on the left has lost turgor pressure, visible in its wilting; the turgor pressure is restored by watering it (right). Tonicity is a concern for all living things. For example, paramecia and amoebas, which are protists that lack cell walls, have contractile vacuoles. This vesicle collects excess water from the cell and pumps it out, keeping the cell from lysing as it takes on water from its environment. Contractile Vacuoles: A paramecium’s contractile vacuole, here visualized using bright field light microscopy at 480x magnification, continuously pumps water out of the organism’s body to keep it from bursting in a hypotonic medium. Many marine invertebrates have internal salt levels matched to their environments, making them isotonic with the water in which they live. Fish, however, must spend approximately five percent of their metabolic energy maintaining osmotic homeostasis. Freshwater fish live in an environment that is hypotonic to their cells. These fish actively take in salt through their gills and excrete diluted urine to rid themselves of excess water. Saltwater fish live in the reverse environment, which is hypertonic to their cells, and they secrete salt through their gills and excrete highly concentrated urine. In vertebrates, the kidneys regulate the amount of water in the body. Osmoreceptors are specialized cells in the brain that monitor the concentration of solutes in the blood. If the levels of solutes increase beyond a certain range, a hormone is released that retards water loss through the kidney and dilutes the blood to safer levels. Animals also have high concentrations of albumin (produced by the liver) in their blood. This protein is too large to pass easily through plasma membranes and is a major factor in controlling the osmotic pressures applied to tissues.